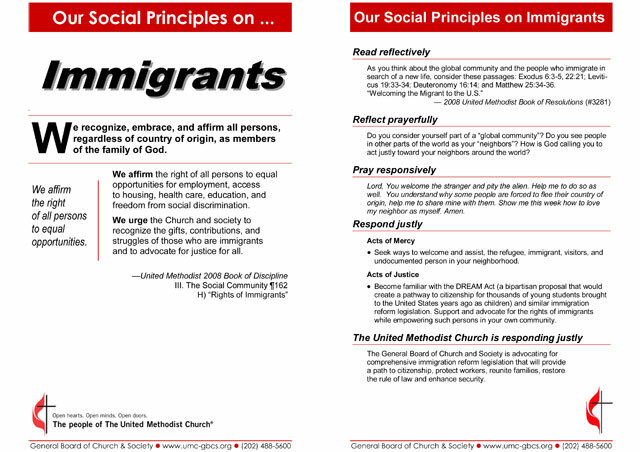 WASHINGTON, D.C. — The General Board of Church & Society (GBCS) has developed bulletin inserts featuring individual United Methodist Social Principles. The bulletin inserts are designed in two colors that reproduce excellently in black and white. They are 11 by 8.5 inches. Twelve Social Principles under the Social Community are in the first release of inserts. The inserts highlight positions approved by the denomination’s highest policy-making body, the General Conference, on issues such as immigrants, health care, religious minorities, racism and children’s rights.